Have I said how much I adore small, intimate weddings? No wedding is ever too small for me. Truly. Mikus & Tiffany’s wedding last June 2018 was intimate and romantic and personal. Tiffany’s beautiful children were a large part of the wedding, naturally, as were their closest friends and family. The wedding and reception took place at the bride’s family home and the groom’s family home, respectively. When I asked Tiffany how she wanted to feel on her wedding, she said like a princess in a fairytale. She told me she loved anemone, peony and calla lily, and I knew at that moment how I was going to design her perfect bouquet. I was asked to design the personal florals only - bouquets and boutonnieres - and a fairytale flower crown fit for a princess. Tiffany’s crown was made with Mokara orchids and pink stock and finished with variegated ivy. Her bouquet, in tones of merlot, crimson and blush, had red amaranth as an accent to the lush peonies and anemone. 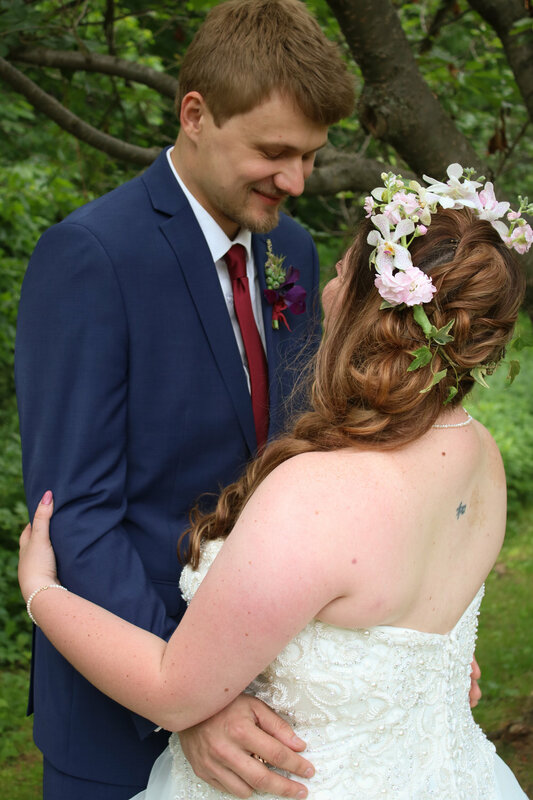 Take a peek at their wedding photographs, taken by a friend of the bride, Katt Thompson, below. There’s so much joy in every shot, it makes me smile. Here’s to your ever after, Tiffany & Mikus. Thank you for letting me be a part of your special day.